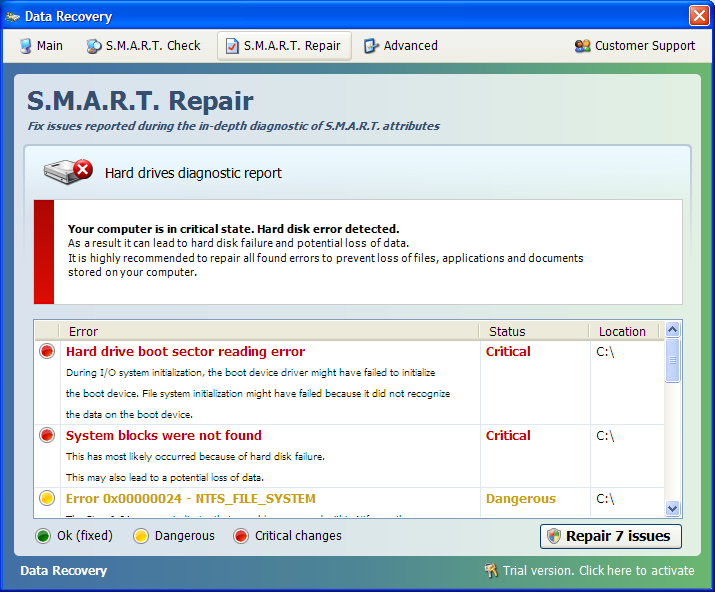 Data Recovery is a malicious software that will display fake alerts, claiming that several hard drive errors were detected on your computer.In reality, none of the reported issues are real, and are only used to scare you into buying Data Recovery and stealing your personal financial information. This rogue software has changed your desktop background,hidden your files and shortcuts and it’s causing browsing redirects. We strongly advise you to follow our Data Recovery removal guide and ignore any alerts that this malicious software might generate.Under no circumstance should you buy this rogue security software as this could lead to identity theft. 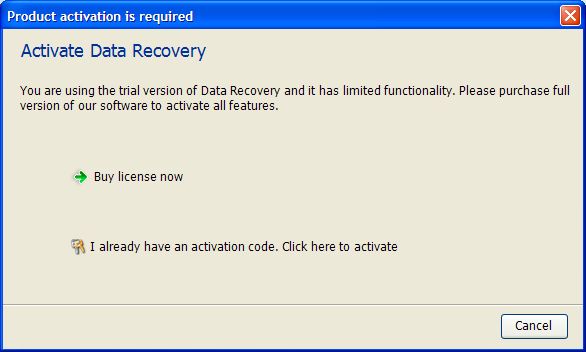 As an optional step,you can use the following license key to register Data Recovery and stop the fake alerts. Please keep in mind that entering the above registration code will NOT remove Data Recovery from your computer , instead it will just stop the fake alerts so that you’ll be able to complete our removal guide more easily. 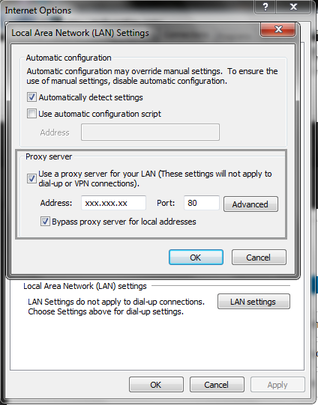 Data Recovery may add a proxy server which prevents the user from accessing the internet,follow the below instructions to remove the proxy. Start Internet Explorer and if you are using Internet Explorer 9 ,click on the gear icon (Tools for Internet Explorer 8 users) ,then select Internet Options. 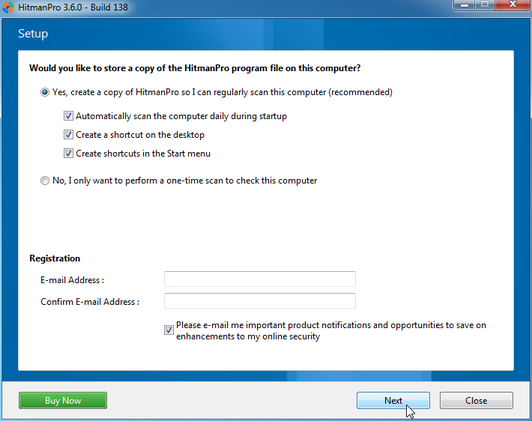 STEP 3: Run RKill to terminate known malware processes associated with Data Recovery. RKill is a program that attempts to terminate any malicious processes associated with Data Recovery ,so that your normal security software can then run and clean your computer of infections. As RKill only terminates a program’s running process, and does not delete any files, after running it you should not reboot your computer as any malware processes that are configured to start automatically will just be started again. 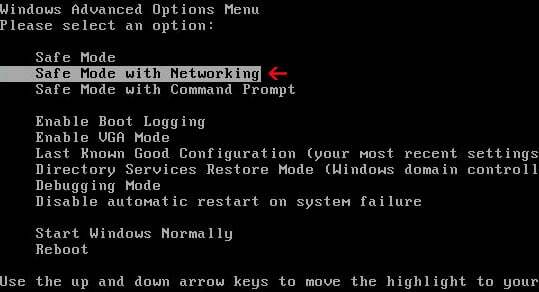 While your computer is in Safe Mode with Networking ,please download the latest official version of RKill. 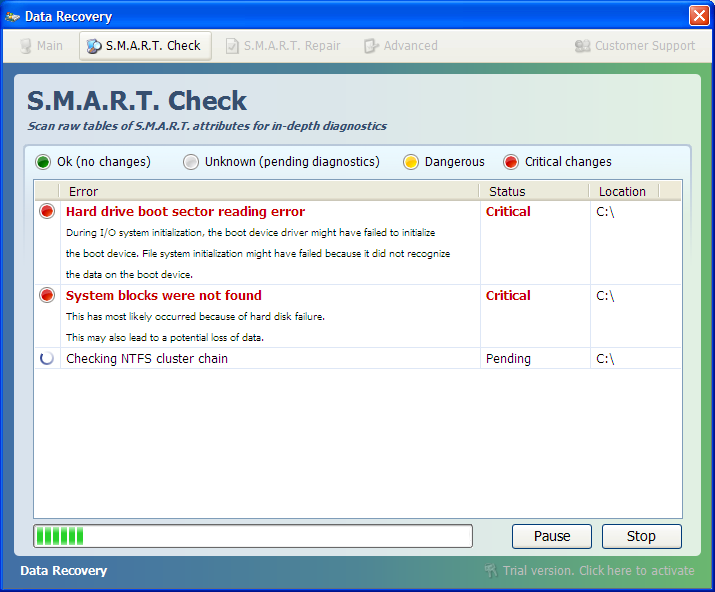 Double-click on the RKill iconin order to automatically attempt to stop any processes associated with Data Recovery. IF you receive a message that RKill is an infection, that is a fake warning given by the rogue. As a possible solution we advise you to leave the warning on the screen and then try to run RKill again.Run RKill until the fake program is not visible but not more than ten times. IF you continue having problems running RKill, you can download the other renamed versions of RKill from here. Please download the latest official version of Malwarebytes Anti-Malware FREE. 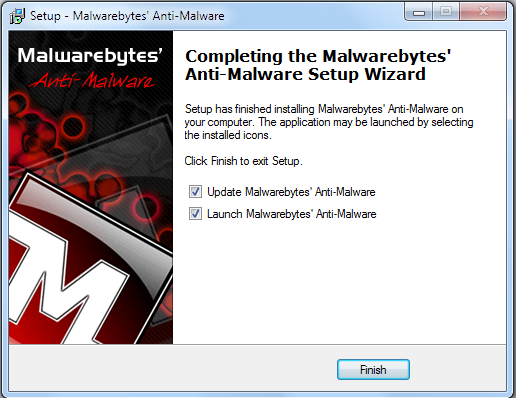 Install Malwarebytes’ Anti-Malware by double clicking on mbam-setup. When the installation begins, keep following the prompts in order to continue with the installation process. Do not make any changes to default settings and when the program has finished installing, make sure you leave both the Update Malwarebytes’ Anti-Malware and Launch Malwarebytes’ Anti-Malware checked. Then click on the Finishbutton. If Malwarebytes’ prompts you to reboot, please do not do so. On the Scanner tab,please select Perform full scan and then click on the Scan button to start scanning your computer for any possible infections. 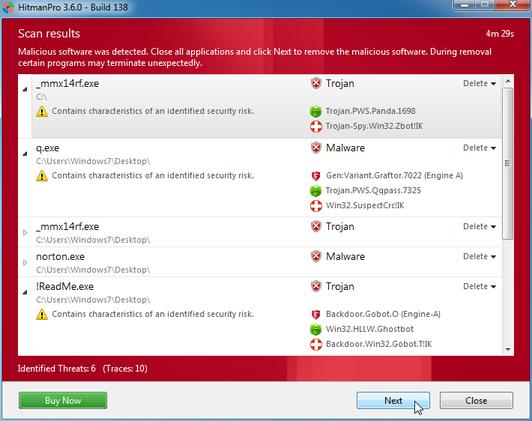 Malwarebytes’ Anti-Malware will now start scanning your computer for Data Recovery malicious files as shown below. Malwarebytes’ Anti-Malware will now start removing the malicious files.If during the removal process Malwarebytes will display a message stating that it needs to reboot, please allow this request. Data Recovery modifies your file system in such a way that all files and folders become hidden, to restore the default settings , you’ll need to run the below program. 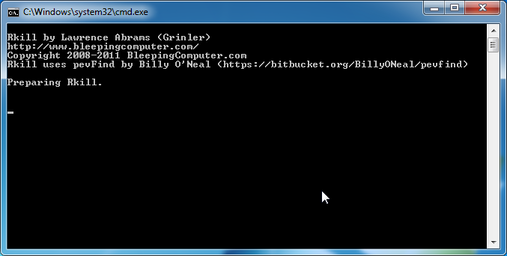 Please download Tweaking.com-UnhideNonSystemFiles.exe to unhide your files and folders. Double click on Tweaking.com-UnhideNonSystemFiles.exe and when the utility starts click on the ‘Start’ button to unhide your files. 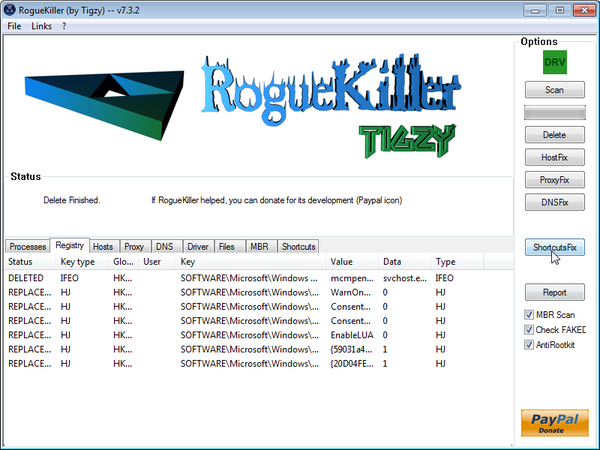 Data Recovery has moved your shortcuts files in the Temporary Internet folder and added some malicious registry keys to your Windows installation , to restore your files we will need to perform a scan with RogueKiller. STEP 8: Get your desktop look back! Data Recovery changes your desktop background to a solid black color,to change it back to default one follow the below instruction. Windows XP : Click on the Start button and then select Control Panel. When the Control Panel opens, please click on the Display icon. From this screen you can now change your Theme and desktop background. 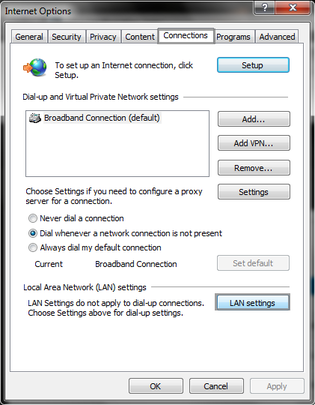 Windows 7 and Vista : Click on the Start button and then select Control Panel. 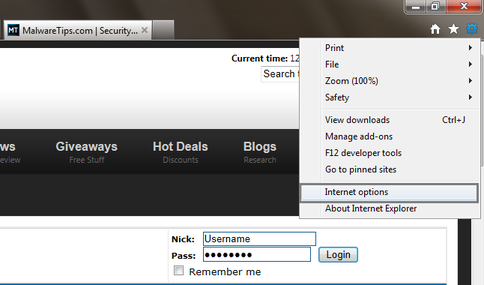 When the Control Panel opens, please click on the Appearance and Personalization category. Then select Change the Theme or Change Desktop Background to revert back to your original Theme and colors. STEP 9: Restore your pinned task bar shortcuts , star menu items and other missing icons. Data Recovery has moved your saved pinned task bar items and other shortcuts into the temporary internet folder, so now we will have to copy them back to their original location. 1. 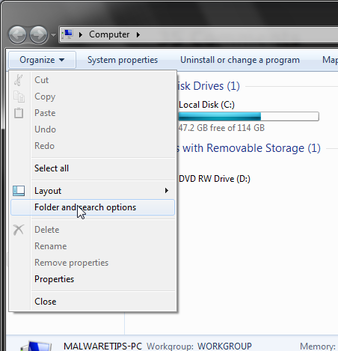 Enable on your system the ‘Show hidden files, folders, and drives’ option. 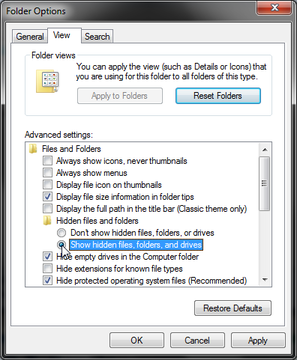 If you are using Windows 7 or Vista,go to Computer → Click on the Organize tab → select Folder and search options. If you are using Windows XP,go to My Computer → Tools tab → select Folder Options. In the new window that appeared select the View tab and choose the option Show hidden files, folders, and drives then click Apply and OK.
2.This rogue software has moved your shorcuts in a folder in the Temporary Internet files called smtmp, so now we will need to copy them back to their original locations. The smtmp folder will contain 4 folders and you’ll need to copy the content of this folders back to their original locations. Windows XP: It does not exist on Windows XP. If you are still experiencing problems while trying to remove Data Recovery from your machine, please start a new thread in our Malware Removal Assistance forum. What’s next? Join our amazing community and build up your malware defenses !